According to the Velominati, the "Keepers of the Cog," they who wrote all "The Rules" that apply to the hard life of road cycling, the bike(s) on top of your car should be worth more than the car (Rule #25. And if you want to know all the rules, go here). But what if you'd like to keep your bike inside your car? Perfectly reasonable concern, I should think, given the odd horror story or two about bike transporting gone wrong. 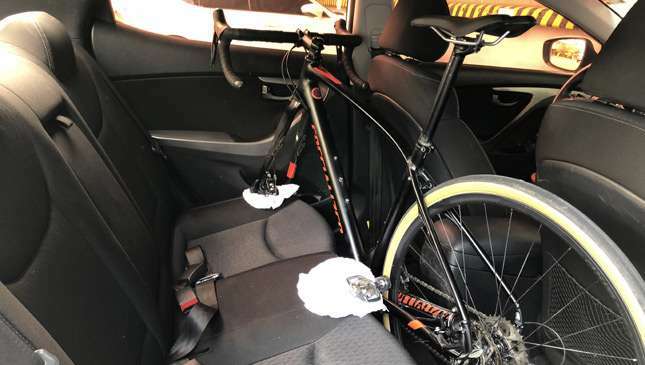 There was that poor guy who was so lashpag from a ride that he completely forgot his bike was on a roof rack, mangling his P500,000 carbon fiber superbike the moment he entered the Magallanes interchange tunnel. Or that girl who badly scratched up her trunk with an incorrectly mounted, strap-on rack. Everybody in local cycling knows someone who has f***** up badly. I posted two years ago that I have a Kuat Sherpa two-bike rack for my Suburban, and it's a really useful thing, but I rarely use it unless I have a big load to carry. These days, I keep my bikes inside my car when going to and from Maximus Athlete's Shop Café (drop by and say hi when you're in the area). It's simple, it's fast, and it keeps my bikes away from prying eyes and wayward vehicles that could scrunch my prized possessions if they were on a rear-mount rack. 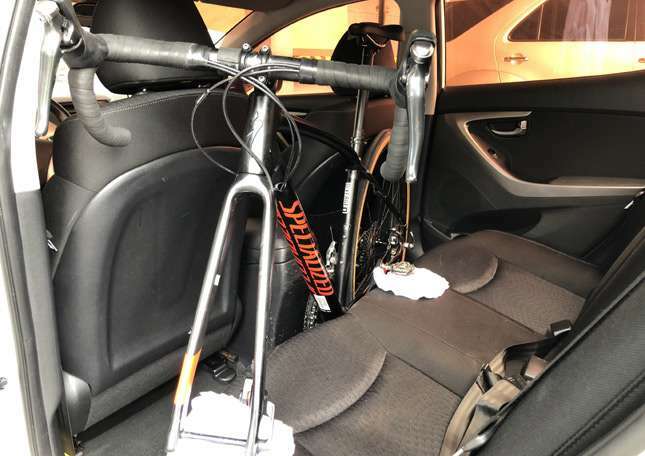 Transporting your bike in your car isn't rocket science, but you do need some common sense and a couple of rags or old towels. Here's a simple, step-by-step process, and you can still seat your kids in the backseat so long as they're not too big yet. In any case, if they complain, remind them of Rule #11: Family does not come first. The bike always does. 1) Make sure your bike is reasonably clean before you stick it in there. Wet Wipes are your friend. Wipe off any crud on the frame and tires so you don't get Gatorade, mud, manure or snot on your upholstery. Muddy bikes are a no-no. 2) Remove the front wheel and store this in the trunk. Make sure you don't slam the trunk hinges down on it. 3) Put the chain on the small ring. To lessen the chance that you'll get grease on the back of the transmission tunnel thingy. 4) Gently place the bike on the floor, non-driveside facing the seat. Position the left pedal at 12'o clock to stabilize the bike on the backseat. Place a clean piece of cloth under the pedal to avoid staining the seat. 5) Place another piece of cloth under the fork dropouts. To prevent these from puncturing the seat. 6) Size matters. This technique works for most road and time trial bikes, and Small to Medium sized mountain bikes, fatties and +Plus size not included. You’ll need a proper external rack for those. 1) Put the gears of bike two in the small chainring and the smallest cog. This is the easiest way to remove the wheels and to put them back on later. 2) If you have wheel bags, use them. Otherwise, they go as is in the trunk. The rear wheel should be at the bottom, cog side down to avoid getting your spokes caught in the gears. 3) You can opt to remove the skewers. Place these in a pouch if you’re fussy, but I don't bother. Just make sure they don't hit the rim or spokes of the other wheel(s) to avoid scratches. 4) Remove the bidons (Euro-speak for water bottles). Carefully place the frame upside down on the backseat, taking care to avoid your rear derailleur from touching the headliner. This actually violates Rule #49 ("Keep the rubber side down"), but these are mitigating circumstances as you definitely don't want grease stains on the seat, do you? 5) Use the seatbelts to secure the frame. In the event of a bad crash, you can rest assured that your babies will be safe from harm. 6) Consider buying a Yakima fork mount. Own a Honda Jazz or some such wagon? Bolt these to a piece of wood around eight square inches for stability. You can now mount your bike upright in the back, with the front wheel removed. Obviously, placing two bikes in your car means no more space for the kids. 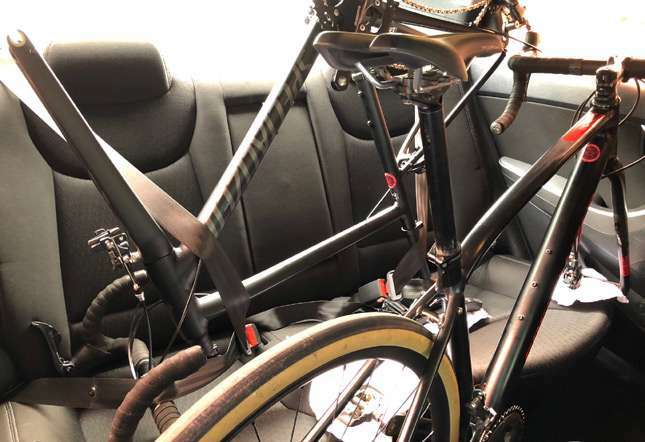 This setup is no longer kid-friendly, and if you plan to regularly transport more than one bike and three people, then a sedan is no longer practical. 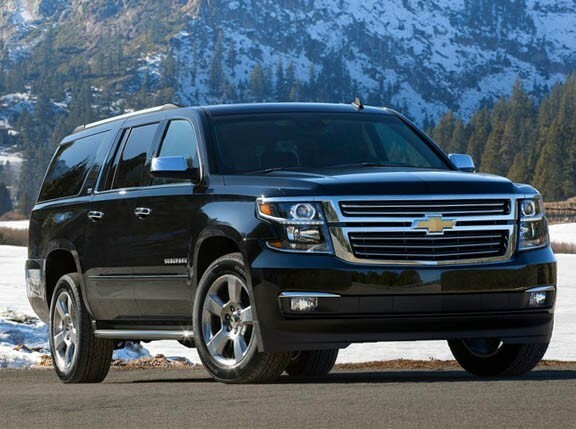 Get a pickup truck or midsize SUV. 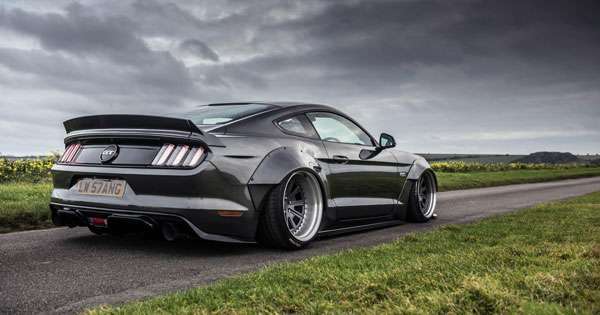 What's it like to drive a modified, wide-body Ford Mustang?